Equity Markets are inefficient and good active managers can add value. What we mean by inefficient is that information on companies in these markets is misinterpreted and that other investors, against which we compete for our returns, make mistakes which are both predictable and persistent. Investing in a disciplined and systematic way, with the use of quantitative models, helps us to identify both risks, and opportunities. All investing is the result of decisions made by humans – it’s all judgment. However the use of quantitative models (designed by humans) can reduce the tendency to extrapolate the recent past and to ignore signals which run counter to our own beliefs. Combining forward looking ‘fundamental’ research work with the historic based ‘quantitative’ modelling approach mitigates the errors that each discipline alone tends to make. A value biased approach is not the only way to invest of course but we have found that the most cost effective way to make money is by using a value approach. The value approach tends to reward investors with higher cash payments in the form of dividends, strong asset backing relative to the price paid in the market, and lower transaction costs in that we are typically buying when others are selling and vice versa. We like this. It is our contention that an investment process, or team, which doesn’t change and/or adapt is likely to be superseded and lose any competitive advantage it held. Most clients would like no change to an investment process but we believe that other investors are smart and motivated, and are also looking for the inefficiencies we are trying to spot. Therefore, within the confines of our “Value” approach and our commitment to a systematic process, we continue to look for new ways to beat the competition and expect to add new tools to our process once we are happy that they are persistent and have a connection to the real world. We are, for example, unlikely to use planetary alignments to pick stocks even though we can create high correlations with astronomy and relative stock returns. We don’t use a macro economic framework to pick countries but prefer to identify cheap stocks with the prospects for change and assemble a portfolio where the predicted total volatility is less than that of the index. Communication between team members is crucial in detecting investment opportunities and focusing on the correct management of the portfolio. Portfolio management is not best done by consensus. The security selection process seeks to identify companies with a superior combination of value, quality, and momentum features. We call this VMQ. 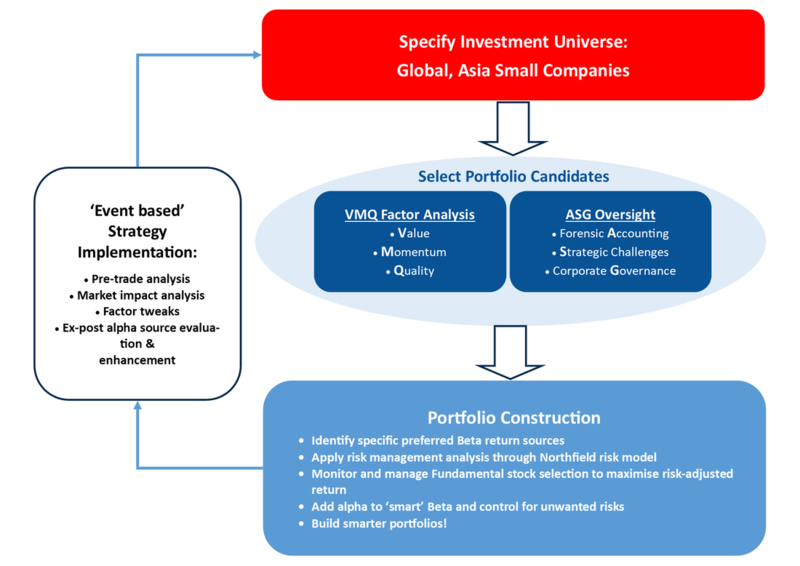 We screen over 2000 companies from the MSCI AC World Index universe and sort and rank them into portfolio candidates based upon their VMQ characteristics. Value - identify securities where consensus expectations of growth and return are too low. Quality - Assess companies based on financial and operating leverage, stability of earnings growth and return on equity. Momentum - We look for positive indicators from short and medium term volatility adjusted relative performance. The market is often right. ​Once we have identified the most attractive candidates from the top 20% by VMQ rank we use knowledge, fundamental research, and risk controls to select up to 30 names which represent a cross section of cheap companies with stable balance sheets, and evidence of upward price movement. Position size varies between 2% - 7% and is a function of the market size of the company and the conviction we have about its return prospects. We review and rebalance the portfolio routinely but will make decisions based upon events in the market rather than a simple calendar basis. We are patient and expect to hold positions for over a year with normal market conditions.